Danny Stadermann started his career in 2004 as a banker for Commerzbank in Hamburg Germany. After 4 years he decided to leave the common banking sector working for a young investment bank. Danny started as a Junior Trader dealing with Forex and Futures and became the Head of Trading in 2009. 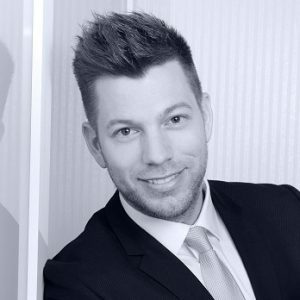 He jointed GBE Prime in 2016 supporting the team to become a well-known Broker and liquidity provider and focusing on the trading infrastructure in Hamburg Germany. With a knowledge of more than 9 years in the Forex industry, he is one of the most experienced trading experts. Danny owns the trading license of Eurex exchange and the basic license of CySec. and see our offers at a glance. GBE Prime is a brand of GBE brokers Ltd. GBE brokers Ltd provides references and links to selected information and other sources of economic and market information as a service to its clients and prospects and does not endorse the opinions or recommendations of the internet sites or other sources of information. Clients and prospects are recommended to carefully consider the opinions and analysis offered in the internet sites or other information sources in the context of the client or prospect’s individual analysis and decision making. None of the internet sites or other sources of information is to be considered as constituting a track record. Past performance is no guarantee of future results and GBE brokers Ltd. specifically advises clients and prospects to carefully review all claims and representations made by advisors, bloggers, money managers and system vendors before investing any funds or opening an account with any broker. Any news, opinions, research, data, or other information contained within this website is provided as general market commentary and does not constitute investment or trading advice. GBE brokers Ltd expressly disclaims any liability for any lost principal or profits without limitation which may arise directly or indirectly from the use of or reliance on such information. GBE brokers is only responsible for complying with laws within the European Union (EU), predominantly Cyprus, and compliance with any laws outside of EU is the responsibility of the Client. GBE brokers do not advertise its services in any territory outside of the EU. Trading Foreign Exchange and Contracts for Difference (CFDs) is highly speculative and may not be suitable for all investors. GBE brokers offers trading on margin. The leverage created by trading on margin can work against you as well as for you. Losses can exceed your entire investment. Only invest money you can afford to lose and ensure that you fully understand the risks involved. Please ensure you read our risk disclosure and terms and conditions completely before opening an account with GBE brokers Ltd.